I got your attention there, huh? Well I did lose, maybe not so much on pounds or kilos but more important than my weight problem is my perennial battle with cholesterol. For the first time in 8 years, my cholesterol level is right on track, from 210 down to 181, my LDL went down from 147 to 115. Even my fatty liver has slimmed down:) An ALT of 41 to 20. My Labatalol [medication] was discontinued and my previous diagnoses of hypertension; hyperlipidemia; and fatty liver were ruled out during my December 16, 2014 physical exam with my primary care physician. All these I accomplished in 75 days. I was determined to bag the award when I started the challenge not because of the prize but because I owe it to myself to be healthy and fit. 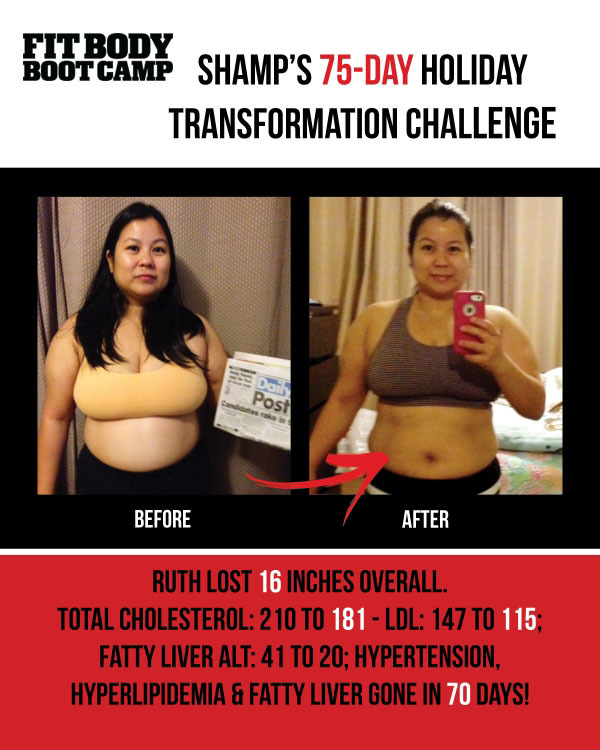 When I was pregnant with my now 3-year old child, I had gestational diabetes and hypertension and my cholesterol level was soaring high at 245. As if these were not enough, I was later diagnosed with fatty liver. I finally told myself that this has got to stop! Oh, have I already mentioned that I also have asthma and was diagnosed with perimenopause at age 36? Happy to say that my hormones function normally now. So my doctor was wrong, I am now 40 and not menopausal yet. I bought a treadmill machine and bicycle that I used for a while, but got so bored with them that I made excuses not to use them. I prayed to God to let me find the right program for me when I chanced upon the Brien Shamp’s Boot Camp. I gave it a try and enjoyed it right away, and I was able to convince my husband to join me after a week. From diet – to exercise – to lifestyle change, I’ve heard them all before. But Brien Shamp’s [Boot Camps] provided me with much more – a complete support system that would later make me a better me. From the best trainer, who serves as a mentor on top of being a coach, to nutritional counseling, to motivational success stories and most of all, a variety of challenging exercises. There were challenges along the way. I had suffered asthma during the challenge; yummy Unhealthy food that I craved so much; busy schedule; and during the times when my weight wouldn’t go down or worse when I would even gain a pound or more in spite of my hard work and efforts. But all these were all part of my journey – I know now. I still have a long way to go, I will still stumble and fall but I am more inspired than ever to get back up stronger each time because Failure is no longer an option. I have already seen the results and I believe that I could be as strong as my determination will allow me to be!